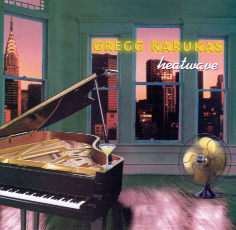 Gregg Karukas (Kuh-ROO-kiss) is one of those artists who had and still has tremendous success in the Smooth Jazz market. He started his career with his album "The Nightowl" in 1987 an independant recording followed by "Key Witness" (1991), "Sound of Emotion" ('92), "Summerhouse" (#1 Gavin in '93), "You'll Know It's Me" ('95), Blue Touch ('98), "Night Shift" (2000) and now "Heatwave" (2002). As a keyboardist he was soon an in demand musician for live events and studio work. He was playing with such known artists as Richard Elliot, Grant Geissman, Ronnie Laws, Melissa Manchester, Brandon Fields, Patti Austin, Brenda Russell, David Benoit, Dave Koz, Kenny G, Ricardo Silveira, Sergio Mendes, and The Rippingtons. He became an original member of this group in the mid-1980's. Gregg has produced or co-produced CD's for artists such as David Lanz, guitarist Phil Sheeran, Shelby Flint, Tony Darren, and the Pointer Sisters. Gregg also arranged and performed most of the instruments on hit tracks for Kirk Whalum, Peter White, Craig Chaquico, and Brian Bromberg. Gregg comments his new album: "Heatwave" was to be released in the Summer, (it got delayed through no fault of mine) and some of the songs, to me, are "cool"; meant to be a relief from the stuffy, humid East Coast summers I "know and love". Others are pretty funky and will make you sweat if you listen to them under the right conditions." Uptown Rendezvous is a laidback grooving tune. Dino Soldo (Sax), Paul Jackson Jr. are sharing Gregg 's journey into light and lush mood. Your Sweet Smile features Michael O'Neill, longtime touring partner of George Benson, Mel Brown, the bassist well-known as a member of Metro and Louis Conte, the in demand percussionist. Rhythm and melody are similiar to often heard songs at Smooth Jazz charts. Nothing to think badly about it. Riverside Drive is featuring in addition to the above mentioned artists the "heatwave horns" (Rick Braun - trumpet, Andy Suzuki - sax and Nick Lane - trombone). An uptempo tune with Gregg's accentuated piano play and Michael O'Neill's quick guitar licks. The title of the song Too Cool (To Be Hot) has its own story. Karen Alves, a Karukas fan, suggested in a competition: "Too Hot to be Cool". Gregg liked it but changed it around to be "Too Cool to be Hot". Gregg comments: "In fact, the title seemed to match another song better, so I made that switch too." Wonderful how Gregg touchs the keys tenderly outlining perfect melodies and creating an atmosphere of uplifting mood. Healing Song showcases Kirk Whalum on sax. Gregg: "I'm dedicating my just finished CD, "Heatwave", to both my parents for their constant support, their tolerance of all my band practices in our garage, and for always allowing me to pursue my musical dreams." Gregg's Mother, Dorothy Conner Karukas, passed away at Monday August 26 after a long, painful battle with pancreatic cancer. I can imagine that Gregg has dedicated especially this contemplative song to his beloved mother. Heatwave is one of those tunes people are dancing on at Gregg's venues on both coasts. Gregg is a really busy musician. A more intimate club jazz feeling is spreaded on Penthouse View. William Kennedy on drums and John Leftwich on bass. Curently Gregg is touring with John and Shelby Flint for the 6th annual Home for the Holidays Tour. More groove is to find on Brooklyn Nights. I like to listen particulary to Andy Suzuki's alto and C flutes. The flute is an instrument which is neglected on many Smooth Jazz radio stations. Dino Soldo is the featured saxophonist on Home To You. Although playing in the best known Smooth Jazz style on Gregg's album, he has released several remarkable albums as "Strange & Beautiful" ("A collection of warm, home-cooked, progressive folk/pop songs that roll along like an Orleans procession") or "StoneCoat", his alias, which was founded in late '96 on the Sonic Images label ("The project was an inspired journey into his cherokee heritage."). All these album are far beyond the Smooth Jazz ground but still easily accessible. Many Smooth Jazz musicians have a great affinity to Latin music. Gregg worked with a number of Brazilian musicians, including stints with Ricardo Silveira, Sergio Mendes, and Grammy nominated recordings with Dori Caymmi. Last Train has some Brazilian accords. Michael O'Neill's guitar work is brilliant. But superior is Gregg's piano play. Bravissimo, Gregg! Remember When is another place of rest. Dave Koz 's sax play is very sensible and emphatic. I Meant What I Said is one of these tunes, most critics are describing as "Smoking". Gregg's album "Heatwave" is the nucleus of Smooth Jazz. This album is highly professional, no wonder with all these great artists staying on the summit of their musician life. Gregg was recently writing about his "fan-to-artist subscriber" concept "In a way, I'm "subscribing" to my favorite artists these days by buying their new CD's on faith. Especially since even the single you may or may not hear on the radio could be very different from most of the music on the full length CD. I will be supporting their "career flow" so they will hopefully be able to continue making more music." Let's start realizing this concept with Gregg's album. It's worth every penny.